This past summer, I was introduced to the magic of Gochujang, a Korean savoury and spicy fermented chilli paste. This ingredient packs a kick of flavour and has now become a household staple, being used in stir fry, dressings and my all time favourite, with roasted brussels sprouts. Remove the base off of each brussels sprout and cut into halves, saving any loose leaves. In a large bowl, whisk together the oil, vinegar, honey and paste. Add the brussels sprouts to the bowl and toss to coat in the marinade. Season with a large pinch of salt and a few grinds of pepper and give the bowl another shake. Place the sprouts on a sheet pan covered with tin foil, ensuring they are spread out evenly. Roast for 20-25 minutes, until the sprouts are crispy and golden. Serve and enjoy! 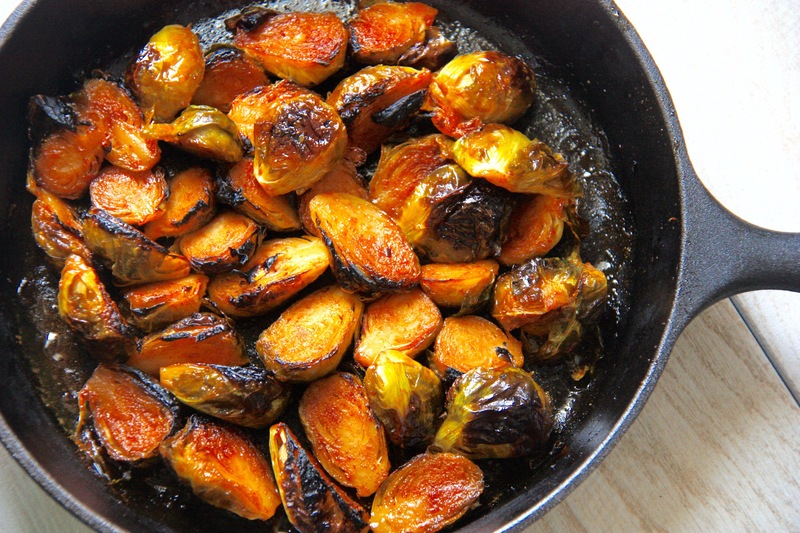 If you have one handy, the sprouts can also be roasted on a cast iron skillet!